A rise in birth defects in the Americas is increasingly linked to Zika virus, previously undetected in that part of the world. Regardless of the underlying cause for these congenital abnormalities, the key to success lies in strong global health leadership. While some lessons from the Ebola outbreak can be applied, this new threat presents a different challenge and needs a different response. In December 2015, the journal Nature asked infectious disease experts to predict which pathogens would trigger the next global crisis. None suggested Zika virus, a mosquito-borne disease first identified 70 years ago in Africa. Yet, a month later, the World Health Organization (WHO) is ‘deeply concerned’ and predicts up to four million cases in the Americas over the next year, including in the United States. Zika virus infection causes mild, flu-like symptoms in most cases. What prompted concern was not the infection, but Brazil’s live birth information system (a system not readily available in less-developed countries) detecting a 30-fold increase in the number of babies born with microcephaly, a congenital defect limiting brain development. If the spreading virus is associated with microcephaly, as evidence increasingly suggests, the global social-economic repercussions could be severe. A large increase in the number of children born with profound learning disabilities worldwide would have severe human as well as socio-economic repercussions globally, causing productivity loss and high associated healthcare costs. Very much like the West African Ebola outbreak, the spread of Zika virus was an almost unpredictable event – a characteristic common to most emerging infectious diseases that end up causing global crises. Unlike Ebola, it occurred in a part of the world where surveillance capacity enabled prompt detection of an unusual event. Source: Center for Disease Control and Prevention. When Brazil detected Zika virus in May 2015 there was no strong evidence of a link with microcephaly, and there is still no definite causal relationship, although evidence now suggests that infection during pregnancy is associated with microcephaly. Zika is also suspected to cause severe neurological symptoms in a small minority of infected adults. Regardless of the underlying cause − infectious, chemical or environmental causes are all plausible at the onset of the event − such a large-scale, unusual health event should prompt the WHO to take rapid action − particularly in light of the criticism the agency faced for delaying the Ebola response. The WHO International Health Regulations (IHR) emergency committee will convene on 1 February to decide whether the spread of Zika virus constitutes a Public Health Emergency of International Concern and advise on next steps. An earlier convening could have affirmed WHO’s position as the global leader during health emergencies − a much needed message after the Ebola outbreak − and galvanized research into microcephaly and its underlying causes. The WHO’s Regional Office for the Americas (PAHO) has already been involved in supporting the investigations in Brazil. The Brazilian Ministry of Health declared a public health emergency on 11 November 2015 and PAHO issued an ‘epidemiological alert’ on 1 December, but these did not attract widespread global attention. However, Zika is not Ebola; it does not spread from person to person, has a low mortality, and does not kill healthcare workers. Zika therefore warrants a different response. It does not require healthcare worker mobilization, treatment centres, contact tracing or safe burial teams. Rather the immediate needs are about research to determine the cause of the microcephaly, diagnostic capacity building and sustained efforts to reduce the mosquito population. Much of this is already underway: Brazilian authorities inspected over seven million households looking for mosquito breeding sites. Their public health agency has generated key evidence for an association between Zika virus and microcephaly and has developed a rapid diagnostic test. The spread of Zika virus, detected in over 20 countries so far, has led to extraordinary measures, such as Brazil, Colombia and El Salvador asking women to delay pregnancy for up to two years, as well as widespread travel warnings to affected countries for pregnant women. What is needed now is strong leadership to ensure coordinated, consistent and proportionate advice to the public and a real focus on the critical research to help us understand what is really happening in Brazil and elsewhere. 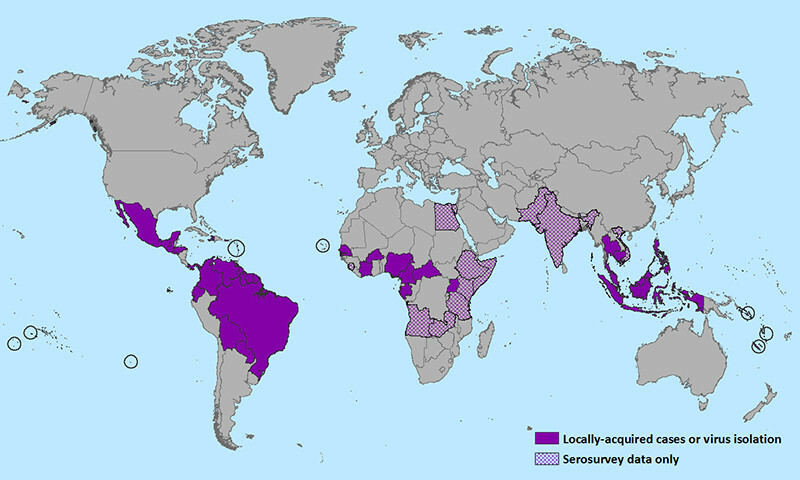 While infections with Zika virus are currently largely concentrated in South and Central America, a rapid spread and mounting evidence of association with microcephaly means it could become a global crisis. Aedes aegypti, the mosquito that carries the virus, can be found in Southern Europe, Africa and the southern United States. There is additional concern that aedes albopictus, the highly aggressive tiger mosquito, could become a vector for Zika virus, further expanding areas at risk. It is unclear how Zika virus spread to the Americas. But like West Nile Virus, another mosquito-borne disease unknown to the Western hemisphere until 1999 but now endemic in North America, Zika could be here to stay. As the Ebola crisis wanes, it is clearer than ever that the nature or location of the next health crisis cannot be accurately predicted. The potential consequences of the Zika virus outbreak highlight once more the need for decisive and prompt global leadership, with robust surveillance and a flexible response capacity ready to face unexpected rather than predicted threats; lessons from Ebola will help but they are not the whole answer − the international community has to stop planning for last year’s problems and solve the current crisis. Michael Edelstein is a Consultant Research Fellow, Centre on Global Health Security. Brian McCloskey is a Senior Consulting Fellow, Centre on Global Health Security.